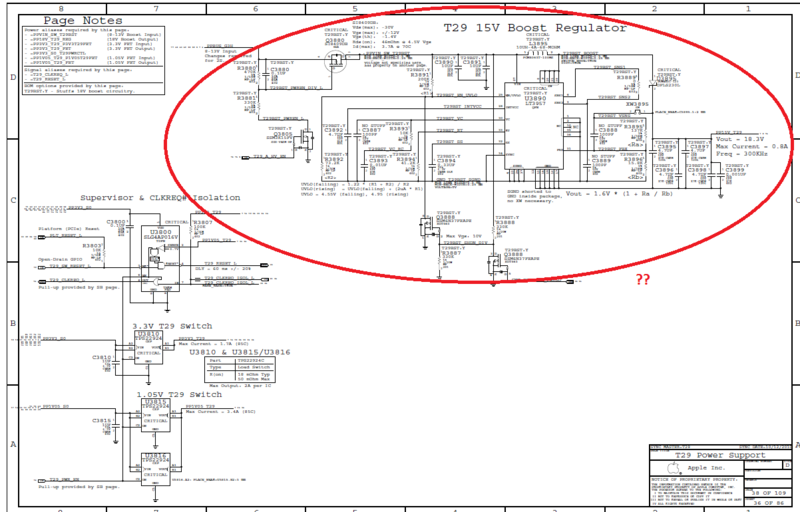 ID of this component on my logic b? I took a look to the logic board and a component (pls see the picture) seems like burned. 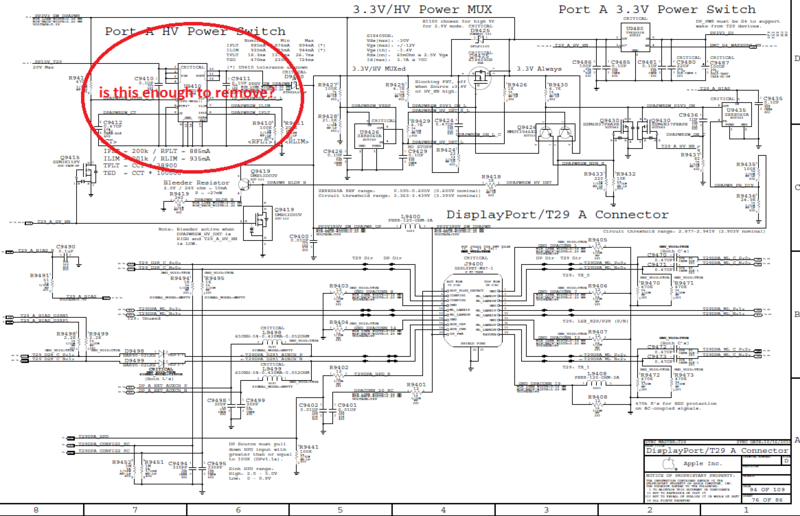 This is pulling down PPBUS_G3H & shorting your 12.6v main power rail of the system to ground which is why it is not turning on. Remove U3890, U9410, and associated circuitry because it's all probably F'd now. Think of it like an appendix. If you are new to board repair it is best to simply remove this and just forget about displayport and enjoy the working machine. If you are using cheap junk equipment to remove it it will be miserable. Try to find some used Hakko gear, they just tossed the FR-801 line out the door. I picked a 2nd one up for the shop for $300, not bad at all. If you are lucky this fixes it, if you are UNLUCKY you have burned CPU power circuitry by U7880. If it went this far, your board is toast. Hopefully your shorts are all in the chips and not in the board, else it goes in the bin. Hi Louis, thank you very much for your answer. I was kinda happy when i saw your post here, I came across your youtube channel couple of days ago and i watched almost all of your videos. i really enjoyed them all, keep the good work up mate! Thanks again for your answers, but I am no electronics tech and am very new to board repair so i have couple of ignorant questions. What do you exactly mean by associated circuitry? just the capacitors and resistors in the vicinity to those chips or the entire display port circuitry? Hi Louis, my MB is resurrected! Thanks to you!!! I just removed the fried transistor Q3880 with a pinsetter without even reflowing it. i just ribbed it off and my MB is back to life! Thank you alot and if someday if i come to NY city i will buy you a drink, promise! or if you wanna visit Munich for October Fest, let me know and i will buy you a drink over here! When I say associated circuitry I mean anything else around that area that is probably shorting to ground along with it. Go to tigerdirect and buy an old $80 off lease Lenovo mini computer.Near the CPU you will see some transistors, find where 1.7v or close is coming off. Attach a piece of wire to this. and attach the other end of the wire to the rail on the logic board that is shorted to ground. Then attach the ground of the lenovo to the ground of the laptop, and turn the Lenovo on. So let''s say you attached the 1.7v from the Lenovo to PPBUS_G3H on the board. You SHOULD see 1.7v on the logic board where PPBUS_G3H would be, but something is shorting PPBUS_G3H to ground, so that power will go to ground. Now since you attached the ground of the Lenovo to the ground of the board, that 1.7v will have a DIRECT path to ground through the shorted component. That shorted component will get very hot and you will know exactly what to remove/replace. I am fairly surprised the big ceramic caps on the line weren't shorted to ground as well, but I guess you got lucky here. I would remove them just incase they got blasted so you can avoid misery later, everything on the T29 boost line, since you do not have boost circuitry now anyway. Just a problem waiting to happen, like impacted wisdom teeth or a damaged appendix. Fatih Cetin sonsuza kadar minnettar olacak.